Chips and Queso. Bert and Ernie. Teachers and librarians. Some things are just better together. Do you know a classroom teacher who would enjoy the TLA Annual Conference? Our annual conference – made up of books, authors, technology integration, makerspaces, curriculum connections, and supportive librarians – may very well be the stuff of teachers’ dreams. They would unquestionably have to experience it to believe it. Now is your chance to make a teacher’s dream come true! 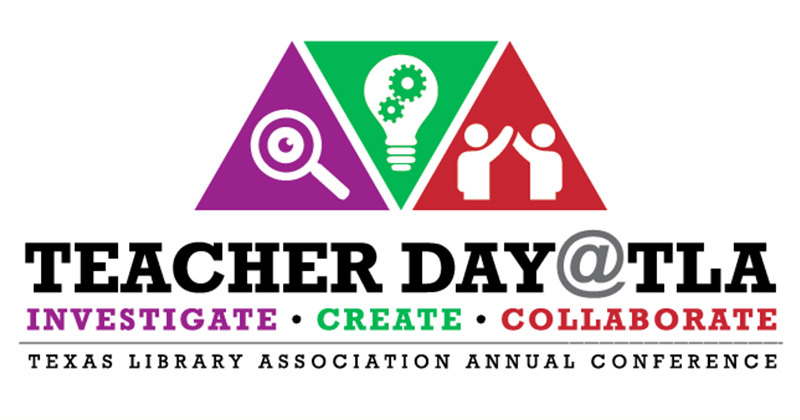 On Wednesday, April 17, 2019, classroom teachers will have the opportunity to experience Teacher Day @ TLA, a special one-day event at TLA2019, comprised of speakers, activities, and pricing designed just for them. Here is your chance to help. You, as a sponsoring school librarian, will play a crucial role by identifying interested teachers, helping them secure permission and funding for their attendance, guiding them through the registration process, and ensuring our guest teachers have a positive experience. Plans are underway for a fun, interactive day for the teachers who attend, as well as the librarians who sponsor them. Participants are welcome to stay for the full conference. The focus of this program is for classroom teachers who experience a TLA conference to return to their districts as library advocates and collaborators – or perhaps become librarians themselves. More details about Teacher Day @ TLA, an event that has become an annual highlight, will be shared by committee members soon via listservs, social media, and the TLA website. Applications to attend Teacher Day @ TLA are now being accepted – don’t delay, apply today. This is an event that should not be missed!